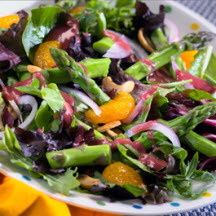 CooksRecipes has quality, kitchen-tested recipes for delicious salads featuring asparagus. 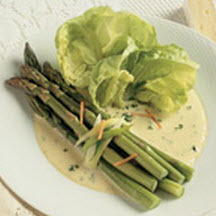 Bundles of crisp-tender asparagus spears, tied together with strips of leek, are marinated in vinaigrette and served with camembert dressing. 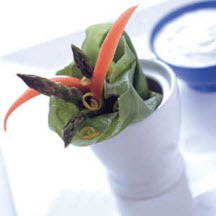 Crisp-tender asparagus and carrot spears are wrapped in lettuce leaves and drizzled with a sour cream-lemon dipping sauce. Recipe courtesy of Michigan Asparagus Advisory Board.